Welcome to the pre-school Äventyret at Tibble Torg! 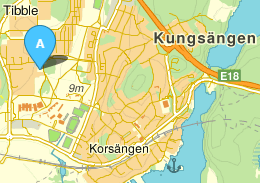 Our preschool is located right at Tibble Torg, close to Kungsängen center and five minutes by car from E18. At Äventyret, mathematics, culture and outdoor education are important. Through play, movement and outdoor activities lays the foundation for child development and health. We are a pre-school located in the earlier premises of the library at Tibble Torg, with committed teachers and daily outdoors activities. Our pre-school sets the foundation for lifelong learning in an environment that is fun, secure and inspiring. Our goal is to allow each child to develop into a unique individual. It is important to us that everyone feels welcome and included. Äventyret is run like a traditional Swedish pre-school. As a parent you have the opportunity to create a meaningful time for your child together with us teachers. If you want to put your child in our queue do it here. Pre-school dep. Humlan: 0732-63 00 12. Pre-school dep. Trollsländan: 0709-53 19 72. Pre-school dep. Myran: 0732-62 63 12. Contact details to our pre-school principal: aventyret@hoppetossa.com or 073-231 93 60. We aim to offer good quality in our preschool. Nothing is so good that it cannot be better and views and complaints contribute to developing the preschool. Give us the opportunity to correct errors and shortcomings by talking about what you are not satisfied with or tell us what we are doing that is good. If it is something that does not meet your expectations or that you are dissatisfied with in your child’s education, turn primarily to us teachers at the preschool. We will then address your point of view/proposal at the next planning meeting so that everyone at the department/preschool will be informed and in these meetings we will also discuss what measures we should take. We give feedback to you after the planning meeting. If we do not succeed in resolving the problem and your dissatisfaction persists, turn to the principal so that the preschool, together with the principal, will be given the opportunity to act. Sometimes a meeting is needed, where you as the guardian, the teacher you talked to and the headmaster are present. The meeting will be a forum for discussing and jointly land in a solution/action. Even after this meeting, the relevant teachers at the department/preschool will be informed so that everyone knows what measures are being taken. If we find that a more in-depth analysis is needed, the principal together with the huvudman makes an inquiry. Complaints are documented to ensure adequate follow-up. Of course, the parental council (föräldraråd/samverkansmöte) is also a good opportunity to raise views/complaints. The parental council is a forum for guardians’ representatives from each department and teachers, as well as the principal. The task of the guardians representative is to highlight suggestions, views and questions from other guardians, and ensure that the other guardians receive minutes from all meetings. The parental council meets every term. It is important for us to have a close and trusting cooperation with the homes.